Ugh. I don't like going to races by myself. This race wasn't chip timed, so thank goodness for Gus. My final time was 51:21, and since this is my first 10K, I'll take it! I have nothing but practice runs to base this off of. :) As many of you suggest...automatic PR! Yay! When it was time to get out of my toasty warm little car I followed the mass of people back to the start. It had warmed up to about 26 degrees by then! Yes! The countdown began and the gun went off...wait, how in the world do you pace a 6 mile race??? I had no idea and winged it, and therefore lost steam throughout the upcoming miles. Another reason for my slower pace in the last 1.5ish miles was because the 5K walkers were turning around to go back to the start on the same trail and holy crap....they were all over the place! I was dodging and weaving and "excuse me"-ing and "on your left"-ing a whole bunch. It was utterly annoying having kids dart around you left and right and then stop for no reason, and I just wanted to get to that finish for some good 'ol H2O! Gah! Frustrating! So, once I cleared some of these peeps, I just took off and tried to pass as many people as I could. I even chicked two dudes at the very end before the finishing chute. Heh. One guy came up to me while I was wandering aimlessly trying to find the water. Him: "Hey, you did great out there." Him: "Yeah, you beat me." Me: "Oh? Well, you did well too. Good race!" Overall, it was an inexpensive race, so it wasn't over the top or "fantastic" by any means. It was a good little jaunt near the river. I was stupid and just wanted some warm food, so I stopped at Jack in the Box for french toast sticks and curly fries. That idea = not good at all. Never had stomach cramps that bad ever in my life. I stayed in bed pretty much until Trav and I had to go to my sister's white elephant party at 5:30. Luckily my Dad was kind enough to pick up mine and Kerrie's Jingle Bell race packet for me up in Seattle so I didn't have to be up there before 4pm (thanks, Dad and Liza!). But, the cure for any sickness is family...and I felt like a million bucks after hanging out with my sisters and family. :) I was ready for the 5K! And that will be my next post...stay tuned for that recap! Nice time! Can't wait to read all about it! Good luck with the 5K - I'll be sending you speedy vibes from rainy SoCal! great time! Good luck with the 5k, can't wait to hear about both! you are so speedy Zoe! Great job! 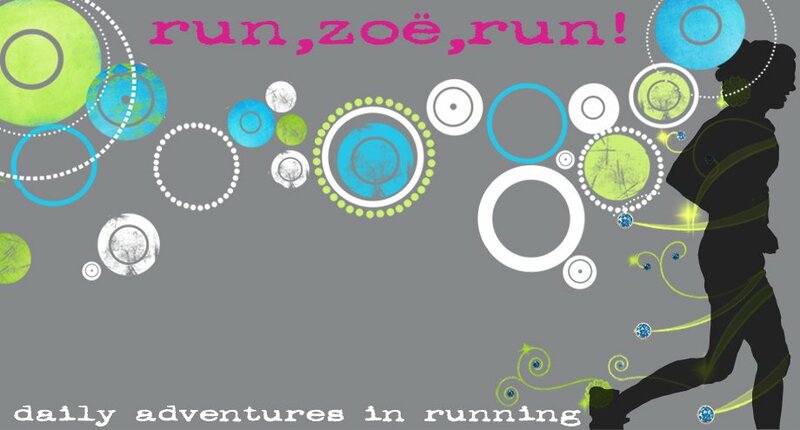 Zoe - 51 for your first 10K is outstanding! Way to go speedy! wow-two races this weekend?? great job-can't wait to hear about both of them!! congrats on the pr! :) 10k's are such a special race... i still don't know how to approach them (and i think most runners have that trouble too!) they're too long and too short all at once. lookin' forward to hearing the details. Automatic PR! Gotta love it! Great job on the 10k! You know, I didn't keep track of my splits during my recent 10K but I got to two miles in about 15:30 or so which would have gotten me under 50 minutes but I didn't finish in under 50 minutes. I think, though, that that's my new strategy, to get out in front and hang on! I don't think I can run, like 8:30 for a few miles, then go to 7:45 for a few miles and then back to 8:something... just don't think I can. So, I'm impressed with your splits, especially with the 5K walkers. Argh. Dude. The walkers. That's how I felt in the Salmon Days 10k. It was so annoying. You still rocked it! And again, THANK YOU so much for taking care of the race packets. Such a life-saver! Great job on the PR and keep runnin girl. "excuse me"-ing and "on your left"-ing... LOVE LOVE it!! that is truly poor planning, I had the same hting at the end of my first half Marathon.. the 5 mile walkers took up the whole road. I wish I would have gotten in for $10 I would have totally done it. So if you are free this weekend I would love to show you the Orting Trail?? If that does not totally sound like a pickup line. Got your card, you are a DIVA.. Love it!! and the return address labels, so AWESOME!! Just read Kerrie's 5K post, I am IN next year tutus and all..
Can you spot a Tall Mom?